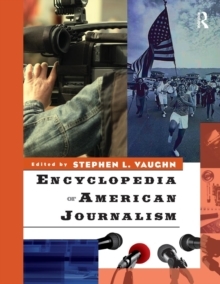 The Encyclopedia of American Journalism is the only single-volume reference work to explore the history of journalism in the United States in print media, radio, television, and the Internet. This groundbreaking volume documents the integral part that journalism has played in the formation of American culture-with 405 entries ranging in length from 500 to 5,000 words. Now in paperback, this volume covers key figures and watershed moments in the history of American journalism. The range of entries is vast, covering historical notables such as William Randolph Hearst and Elizabeth Cady Stanton and contemporary press personalities like Tom Brokaw and Helen Thomas; news outlets including CNN, New York Times, Salon.com, Sports Illustrated, and the Associated Press; historical themes and practices from muckraking to reporting on terrorism; and much more. Every entry includes a substantial list of suggestions for further reading. The Encyclopedia of American Journalism is an indispensable reference for anyone seeking to understand the foundations of the press as the "fourth pillar" of American democracy.